The Weinstein Company has just announced that Quentin Tarantino‘s The Hateful Eight is set to open in limited 70mm release in theaters on Christmas Day. THR adds that the film will then make its wide digital release in theaters on January 8, 2016. More on the story below. We’ve known that Tarantino has been hard at work retrofitting 50 theaters to be able have proper 70mm showings. This is very important, as it will give audiences a theatrical experience like no other. 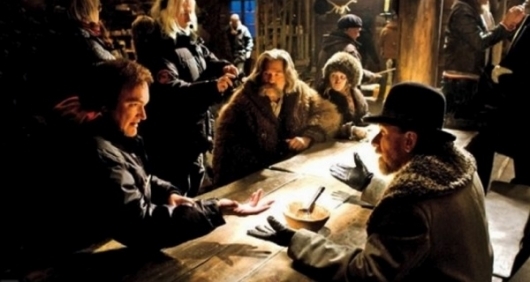 The Hateful Eight was lensed on 65mm, and was intended to be presented on the widest screen possible. Its being reported that the film is the “first production since 1966’s Khartoum to use Ultra Panavision 70 anamorphic lenses.” In fact, it won’t be the last time we would see films make use of these Panovision lenses. It is being reported that Star Wars Anthology: Rogue One will also use the same technology, although that has yet to be confirmed. Set years after the American Civil War, The Hateful Eight centers on eight westerners, from different walks of life, together to seek refuge from a blizzard. The film has a powerful cast that consists of Samuel L. Jackson, Kurt Russell, Jennifer Jason Leigh, Walton Goggins, Demián Bichir, Tim Roth, Michael Madsen, and Bruce Dern.